Sailendra Bhaskar writes: I read this recent post in an internet magazine called The Better India and thought you would find this article of ­interest. In the 1980s, Japanese national Shuzo Matsunaga and S.M. Muthu from Tamil Nadu developed an unlikely friendship over their common love of literature. In 2007, this friendship resulted in the Japanese government issuing postage stamps in honour of Muthu. An English translation of Thirukkural. In libraries across Japan, you are likely to stumble upon a book by Shuzo Matsunaga titled Thirukkural, nestled among their classics. The book is a Japanese translation of a Tamil classic by the same name. Through a marvellous sequence of events, the book led to the Government of Japan felicitating an Indian man named S.M. 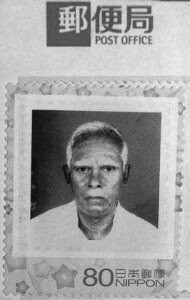 Muthu, by issuing commemorative stamps with his picture on them. The story begins in the 1970s when Japanese national Shuzo Matsunaga chanced upon a few translated lines from Thirukkural. 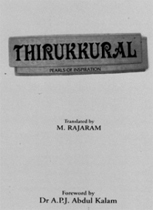 Thirukkural is often lauded as Tamil’s greatest contribution to Indian literature. The book is believed to have been penned by a renowned writer and poet, Thiruvalluvar, either in the 6th or 1st century BC. Over 133 sections and through 1330 couplets, the author discusses virtue, love, governance, and society. This seminal work is believed to have had a great impact on Tamil literature, culture and society. The universality of its aphorisms translated into a global audience for the book. It is no wonder then that years after Shuzo first came across a few lines from the book, he was still fascinated by it. He reached out to Shekar, his pen-pal in India, telling him that he wanted to read more of the work. Shekar then put him in touch with his father, S.M. Muthu. Born in Omalur, near Salem, S.M. Muthu loved Tamil literature with a passion. He sent Shuzo, G.U. Pope’s English translation of Thirukkural. And a friendship was born. Letters in Shuzo’s neat even hand began finding their way to Muthu with greater frequency as Shuzo set out to translate Thirukkural. “We exchanged about 50 letters when Shuzo worked on Thirukkural. He would send me photocopies of the pages in which he sought clarifications and I would write back to him,” Muthu said. By 1980, Shuzo had completed his translation of Thirukkural and in 1981, he made his maiden trip to India where Muthu had arranged for him to attend the 5th World Classical Tamil Conference in Madurai. “He was tall and fair. When he saw me, he bowed and folded his hands to say vanakkam (welcome),” Muthu recalls. It was the first time the two friends were meeting, after having corresponded for over a year. At the conference, Shuzo presented his research essay on Thirukkural. During his visit, Muthu brought up the idea of introducing his Japanese friend to another renowned Tamil poet, Bharathiar. 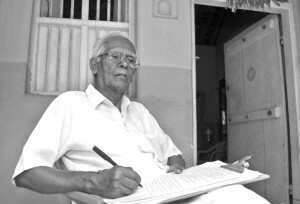 Shuzo, whose fascination with Tamil literature had only grown over the years, readily agreed. With each letter they exchanged, the friendship between the two grew, cemented further by their common love of literature and respect for each other’s cultures. In the swishes and swirls of Muthu’s handwritten letters, Shuzo saw – and fell in love with – India. From learning about festivals like Deepavali and Pongal, to understanding the different rituals followed during weddings and funerals, Muthu’s letters took Shuzo on an unforgettable journey through India. Shuzo even went on to compile these letters into a book titled, My India as Seen through Letters. Over the next couple of decades, Muthu helped Shuzo translate several popular titles, including Manimegalai, Naaladiyar, Panchathanthira Kathaigal and Voice of Vallalar. In turn, Shuzo began to share English translations of Japanese books that Muthu went on to translate into Tamil. Muthu’s work soon found its way to newspapers, magazines and publishing houses. Across a distance of 5,956 kms and over a period of more than three decades, the steadfast friends helped contribute greatly to the literary discourse in their respective countries. 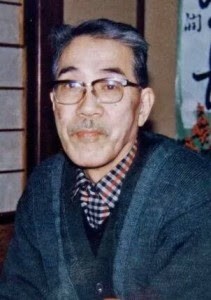 In 2007, the Government of Japan recognised Muthu’s contribution towards Japanese literature by issuing a commemorative postage stamp with his photo. Despite age catching up with them, the two friends continued to write to each other regularly. Muthu passed away recently, but not before showing us that friendship and literature transcend borders, culture and language. 1790Must SSLC lag behind CBSE? Must SSLC lag behind CBSE? 1792Will Chennai’s Corporation learn from London’s? Will Chennai’s Corporation learn from London’s? 1794Is Chennai India’s ­accident capital? Is Chennai India’s ­accident capital?